Forum Index > Historical Arms Talk > Norman fighting styles? Posted: Wed 29 May, 2013 9:47 am Post subject: Norman fighting styles? I joined this forum about a month ago and I have been searching around. After a lot of Internet searches I still don't know if norman one-on-one combat was more similar to viking or more like I.33 stuff? Does anyone have any historical references showing what it was like? There is basically nothing for the Norman era, nor anything in the 12th or 13th centuries (excluding MS I.33, if we accept the date of 1295 AD) that instructs on sword and shield combat, nor mounted sword and shield, nor lance and shield. The only sources available are images from the period. However, the number of images showing knights fighting is fairly limited. And the number of images that actually depict two (or more) knights physically striking one another is even fewer- less than three dozen by my estimate. So the evidence is frustratingly thin. That having been said, in the earlier images (especially from the Norman era, rather than Plantagenet era), kite shields are shown facing forwards, turned inwards, and turned outwards. This quite closely matches what we see in later 13th and 14th century manuscripts which depict heater shields being used. The good news is that there are many images showing the usage of sword and heater shield from these later eras, so with a bit of extrapolation, it is possible to reconstruct a plausible fighting form. That's the best we've got at this time, I'm afraid. Thanks, that's what I was worried about. For the Norman era, there are relatively few images, although there are considerably more if you include the early Plantagenet period, up to the death of Richard the Lionheart. From 1200 onwards, you will find far greater numbers of images of combat. Especially in mid to late 13th century and well into the 14th century, there are numerous good images of combat with sword and heater shield. Yes, it is very hard to pull useful information from MS I.33. Bucklers are just too small to get a feel for what it is like to fight around a large kite shield. 1. The shield is a weapon to use offensively, not something you hide behind. 2. Hold it away from you, or it blocks a great deal of your vision. The only tricky thing about this is that you are more likely to end up with "error" if you simply try to start, brand new, and try to create your own style. I would really recommend using the images from 1050 to 1350 AD or so as a guide for your fighting. Just closely observing the images and noticing things about them will put you off on a much better track than simply trying to go it on your own. 1) Get some sort of sharp sword to practice doing cuts solo with, and to use to practice cutting against objects. If you cannot afford a high end sword like an Albion Norman, Senlac, or Reeve (all of which are superb swords and very much worth the effort to acquire), then at least get a Hanwei Tinker Norman Sharp and use it to practice: [url]http://www.cashanwei.com/product/tinker-norman-sword-sharp/sh2426#!prettyPhoto[gallery]/0/[/url]. It is impossible to learn to cut properly using even the best waster. You have to have a sharp steel sword to develop good edge alignment. If you cannot even strike properly, wouldn't trying to learn sword and shield fighting be the same as trying to learn ice hockey without being able to skate? Striking properly is critical to everything else you do, so get a good sharp you can practice with. 2) Learn Liechtenauer's long sword or I.33. Either one will help you become much better in knowing what to do, and how to do it, for Norman sword and shield. I personally recommend using David Lindholm's Knightly Art of the Longsword for private study. It's a very good guide, and while I do not agree with every one of his interpretations, he gets a lot of stuff right. Personally, I would beware the temptation to join another group; if you earnestly follow Lindholm's translation and interpretation of Ringeck, paired with lots of thinking and contemplation of his translation of Doebringer, [url]http://www.thearma.org/Manuals/dobringer.html[/url], always with the aim of trying to improve each and every large and subtle action you do, you will eventually find yourself becoming more confident and skillful on your own/with your friends than had you joined a group. 3) As mentioned before, spend lots of time looking at the images of sword and shield combat. Really, while there may not be step-by-step instructions as you might like, there's really no point trying to reinvent the wheel. Since the images of knights fighting are supposed to represent real, life and death fighting (ernst fechten), the techniques and actions they show are a far better guide than just trying to make it up. There are thousands of ways to "make-up" a poor or sloppy version of sword and shield; there are very few ways to do it well and do it right. Since you want to do it well and do it right, make use of the images, and study them carefully. I post this Video, because I think it Shows nicely what Shane Dopson meant when he advised to use the shield offensively. And Roland gives some nice Points about using the shield in angles. I hope I could help, even if ist more viking than norman style. BTW...I know there are depictions of foot soldiers fighting with kite shields ( Bayeux tapestry...) but I think regarding the shape of the kite shield, it was mainly designed for mounted warriors. Because when you sit on horseback the kiteshield covers the rider from shoulder to ankle. The riders used to attack a shieldwall by riding alongside, shield side facing the enemy ranks, and stabbing with their Lances towards the enemies. And for that strategy the kite was the perfect cavalery shield. And the weight of the shield was not only carried on the arm, it was carried with a leather strap around the shoulder. I planned on getting the hanwei tinker norman sword anyways( can't afford a albion). Any pictures of the strap system on the kite shield? I have experience with two handed swords but not with one handers. Do you guys know any places that make wasters with Brazil nut pommels? but I think regarding the shape of the kite shield, it was mainly designed for mounted warriors. Because when you sit on horseback the kiteshield covers the rider from shoulder to ankle. I would be very interested to know if anyone has seen evidence of kite shields being used in the manner described above on horseback before c. 1100. It seems to me that the lengthwise positioning of a long shield in front of a rider's body relates to the introduction of couched spear combat. This is not what the riders in the Bayeaux Tapestry for example are doing. Here the shields don't cover the legs much at all, since they are not held vertically from shoulder to ankle, but rather are sloped back at a diagonal angle. Not wanting to turn this thread onto a different subject, it seems however when kite-shields are used on foot pre-1100ish, and no doubt later, they are held vertically, and do provide good protection for the body and legs, especially when used en masse in a shield wall. So I'm not convinced that kite-shields are cavalry-specific, or even cavalry-biased. If you don't have much or any plate armour, a big shield tends to be seen as a good idea. The kite-shape is a good balance between coverage, weight, and convenience of carriage. The ones I've made and used on horseback and on foot have never seemed terribly heavy, and one feels pretty safe behind them. Oh I don't mind I would like to know also. To me it is the principle of "Form follows Function". 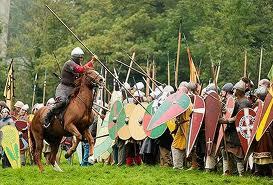 At the Battle of Hastings Reenactment they where doing exactly what I described. Riding along the enemy lines, Shield side facing the enemy and stabbing with the lances from overhead. And it where the Normans as far as I know who introduced cavalery attacks in large scale to the battelfields of western Europe. The Anglosaxons and Vikings of the day still relied on the old shield wall, even if they arrived at battlefield on horseback. 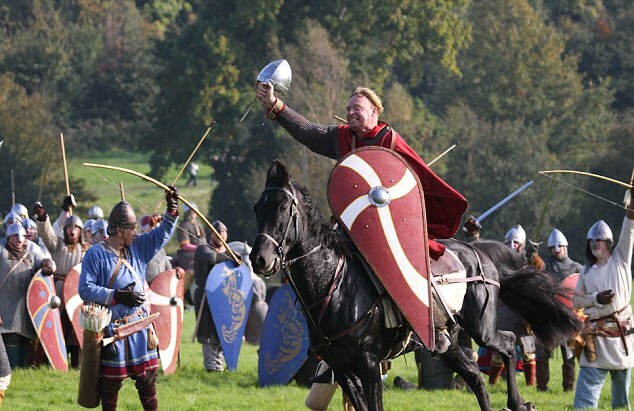 Normans where the first to breed and train destriers which where only used in battle and not for riding from A to B. With These changes in warfare, the change of the shield shape from round to kite makes sense to me. And looking at pictures from the Hastings Reenactment I think One could See how well fitted the kite shield for cavalery is. ....you asked about the source for good swords. Good looking and High quality swords for a good price. You can have Each sword with a blunt or sharpened blade.. Even the blunt swords are quite accurate in weight and balance. I have three swords from Pavel Moc and I am happy with all of them! Here is the Hastings.....I guess it is a sword of that type what you are looking for. Sure, that may be true, but modern reenactment habits are not primary evidence for the historical use of shields. That is not how the Normans are illustrated in the Bayeaux Tapestry. It is my impression that kite shields where multipurpose shields. They are just as dominant in depictions of infantry, and their form is probably better suited for use on foot. In fact, it remains in use as a infantry shield long after the shorter heaters have become the standard for cavalry. When it comes to the use of these shields, the fighting style is different from sword and buckler or longsword, simply because of the nature of the shield and the way you hold it. Of the existing manuals, I.33 would be a good place to start to learn some basic sword handeling and defensive principles with the shield. This posture can be found in some illustrations, and works quite well. From this positon, your attacks are mainly thrusts over the top of the opponents shield (described by marozzo) and fast blows to the side of his head. All else is covered by his shield. The forward tilt of the shield gains you some range. Defence is maintained by moving behind your shield, and covering the targets/angles from which he can strike. Wow elling that was very helpful! Thanks christoph, I'll check him out. Robin; Marozzo simply uses his genreral purpose 1530s sword with the shield. A sword that is indeed quite unsimilar in appearance to medieval swords. But the techniques he mentions works perfectly well with shorter blade reenactment swords. Which are LESS similar to the blade he uses that the long bladed type XIs and XIIs that are popular in the heyday of the kite. These weapons are frequently 90cm+ (36 inches), and thus noticably longer than the one handed swords used in the dark ages or late middle ages. There is a 12th century illustration of knights fighting that depicts the exact same position shown in the Marozzo figure. So, in this case, there is no harm done in using the illustration, because it was valid for the period. Of course, there are many other instances of knights depicted with kite shields not being held at the angle found in Marozzo, and sword and shield play must take that into account. Nevertheless, it is not an anachronism to hold the shield as found in this Marozzo image. PS: The image is not available on Manuscript Miniatures and is very difficult to find online. It is a picture of the death of Saul, and it comes from a German manuscript if I am not mistaken.